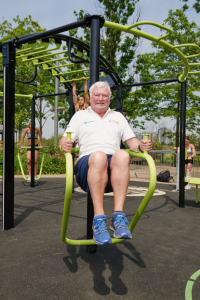 The legend lives on at the Queen Elizabeth Olympic Park in East London – with the launch of the world’s first gym made from recycled aerosols. 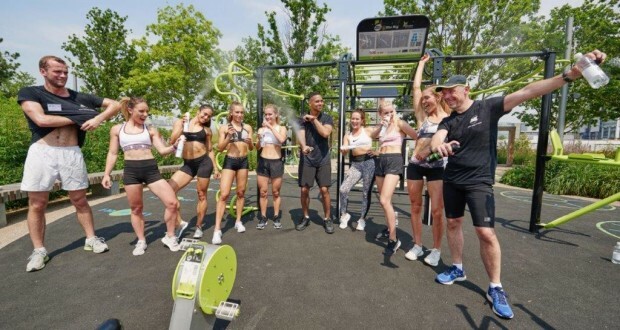 A Green partnership with recycling company Terracycle and the Great Outdoor Gym Company and deodorant company Right Guard have created an amazing community gym right at the entrance to the park. The gym is unique because it’s made from discarded deodorant aluminum and antiperspirant cans. Some 2,500 discarded cans were collected by Right Guard at supermarkets and retail points throughout the country and the rescued aluminum was turned into training features such as a spinning bike, cross trainer, training bars, exercise bikes… as seen below. One contestant who came through with flying colours was Good Holiday Editor John Hill, who kept up with the fitties and won top prize of a year’s supply of Right Guard. Previous: Flack off – you’re so Moneysupermarket!